John Geiger and The Shoe Surgeon just pulled back the curtains on their latest custom sneaker project, and this one&apos;s worth the wait. 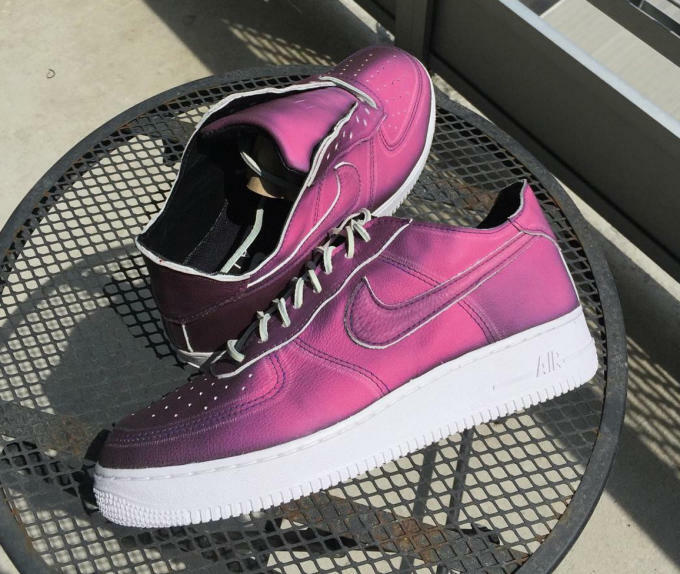 This time around, the duo stick with Geiger&apos;s staple Nike Air Force 1 to create a handmade low top that features heat sensitive, color changing purple leather uppers. Sounds crazy, right? Instead of trying to do it justice with words, we&apos;ll let the clip above do the talking. Aside from the color changing leather treatment, these custom Air Force 1s appear to use a deconstructed build with minimal padding around the ankle area—perfect for stunting in the sun. There&apos;s no word if this pair will actually be released to the public, but we do know that Geiger will be doing a special release for a to-be-announced sneaker at tomorrow&apos;s Baltimore Sneaker Show event, so don&apos;t miss out on that if you&apos;re in the area.